Keep your horse warm and allow him to still move freely in his Rambo® Optimo. This breathable liner of thermobonded fiberfill quickly and easily attaches to selected Rambo® Optimo Turnout. The Rambo® Optimo Liner utilizes Velcro and snap closures to allow you to attach the liner to the outer shell without extra bulky straps. The inner liner and outer shell operate as one unit. No more shifted and disheveled under blankets. The Optimo Liner also offers the same Rambo® split technology of the outer shell so you don't have to sacrifice free movement for warmth. Great fit for my extra large Warmblood. Liners easy to switch out. First time purchasing this product, I have no comment. Could this be used as a stable blanket? BEST ANSWER: It would be difficult to use as a stable blanket by itself as it does not have leg straps nor does it have hooks to add leg straps. I use it under a sheet or blanket and attach it to the sheet or blanket to keep it secure. Great blanket liner. No, because it does not have leg straps or belly strap. It has two snaps that connect to a sheet or blanket in the back where legs straps go. No probably not, there is no surcingle to keep it in place and they are very lightweight, even the 400 gram shifts quite easily. 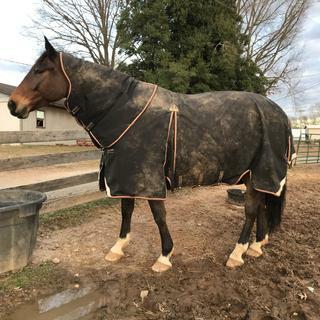 The blanket is awesome but if your horse rolls in the stall be sure to get a blanket with leg straps. Does this liner have the gusseted shoulder? BEST ANSWER: I still question this. At Horsewear Ireland it is pictured as having a gusset, but it is not pleated nor nearly as deep as the gusset on the outer sheet. Which causes me to wonder whether it will restrict the movement of the horse after all. Is the liner really the same as pictured here? At the Horseware Ireland, and other sites, it's pictured as light gray with quilting, and the front vent is not split as much as the outer sheet. BEST ANSWER: Liner utilizes Velcro and snap closures to allow you to attach the liner to the outer shell without extra bulky straps. I was asking about the picture. Is it a picture of the Rambo Optimo liner with fiberfill? - the part that is *not* waterproof and snaps to the outer part in order to add warmth?